Notification NO.SO(S-II) 1-180(Misc. )/2019 Karachi dated 11 Feb. 2019 regarding Re-designated /Upgraded Posts of Junior Elementary School Teacher by a government of Sindh school education & literacy department. The Director Schools Education (Elementary Secondary & higher Secondary) Karachi / Hyderabad / Mirpurkhas / Shaheed Benazirabad / Larkana/ Sukkur. Subject: PREPARATION/ MAINTENANCE OF LIST OF (BS-14) AS JUNIOR ELEMENTARY SCHOOL TEACHER (BS-I4) AND SENIOR EARLY CHILDHOOD TEACHER (BS-15). It is directed to refer to this department order dated 23-07-2014 on the subject noted above. 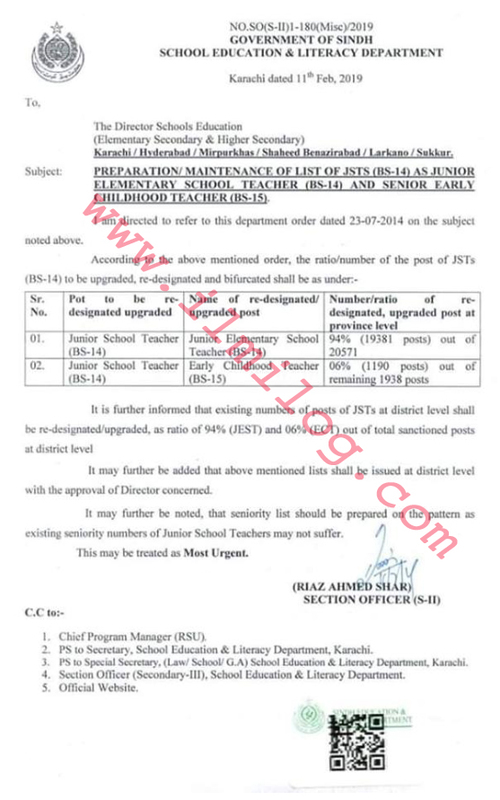 It is further informed that existing numbers of posts of JSTs at district level shall be re-designated/ upgraded, as the ratio of 94% (JEST) and 06% (ECT) out of total sanctioned posts at a district level. It may further be added that above-mentioned lists shall be issued at the district level with the approval of Director concerned. It may further be noted that the seniority list should be prepared on the pattern as existing seniority numbers of Junior School teachers may not suffer. This may be treated as Most Urgent. I. Chief Program Manager (RSU). 2 PS to Secretary. School Education .t Literacy Department. Karachi. 3. PS to Special Secretary. 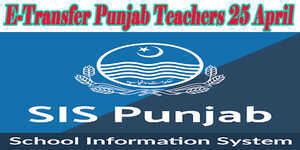 (Law/ School/ G.A) school education & literacy department. Karachi 4. Section Officer (Secondary-III). School Education & Literacy, Department. 5. Official Website.